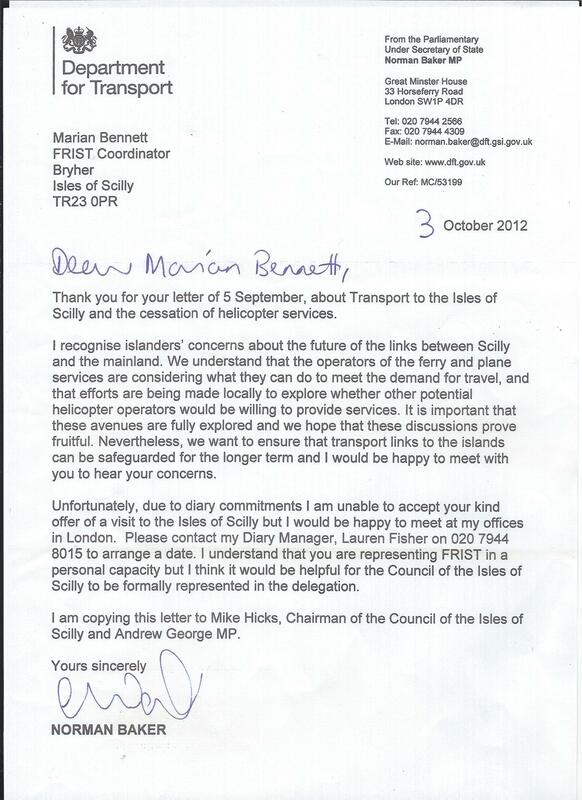 In a response to a letter from FRIST the Minister has acknowledged islanders' concerns over transport links. He explained that it was important that local efforts to make good the transport shortfall were fully explored and he hoped efforts would be fruitful. However, he went on to say “we want to ensure that transport links to the islands can be safeguarded for the longer term”. The Minister regretted that due to diary commitments he was unable to accept FRIST’s invitation to visit the islands but he has agreed to meet a delegation from FRIST in London to hear concerns. A meeting has been agreed for 1 November and will included representation from the IOS Council. Click here for Minister’s letter dated 3 Oct 2012. This is really good news and a strong indication that FRIST has been recognised by the Minister as a community group whose views he should listen to. Of course we shouldn't expect instant results, but FRIST is now very much in the Minister's consciousness as a significant player going forward. Well done, and good luck next month. Sign up to support FRIST and receive periodic newsletters here. Your contact details will not be shared with any 3rd party. Construction of a new ferry to serve the Isles of Scilly could save Appledore shipyard!